Happy Friday! So glad to have you back again–thank you for taking the time out of your busy schedule to write a bit with us. One of my own personal writing goals this year is developing a daily writing habit–and I’m delighted to report that it’s so far, so good! Whatever your own goals this year, it’s my hope that the little weekly prompt found here brings you inspiration and a wee bit of necessary squishiness from this most Extraordinarily Awesome writing community. This week we’re (already!) back to the top of our first quarter rotating panel of judges: M. T. Decker! She had such a blast the first time, I was a little worried this second go might do her in. But she is such a determined creature and will not be dissuaded. Therefore I implore you each to write brilliantly and give her The Most Unforgettable Contest of All Time. Reminder! We now have a required extra challenge with the weekly prompt, called the Dragon’s Bidding. 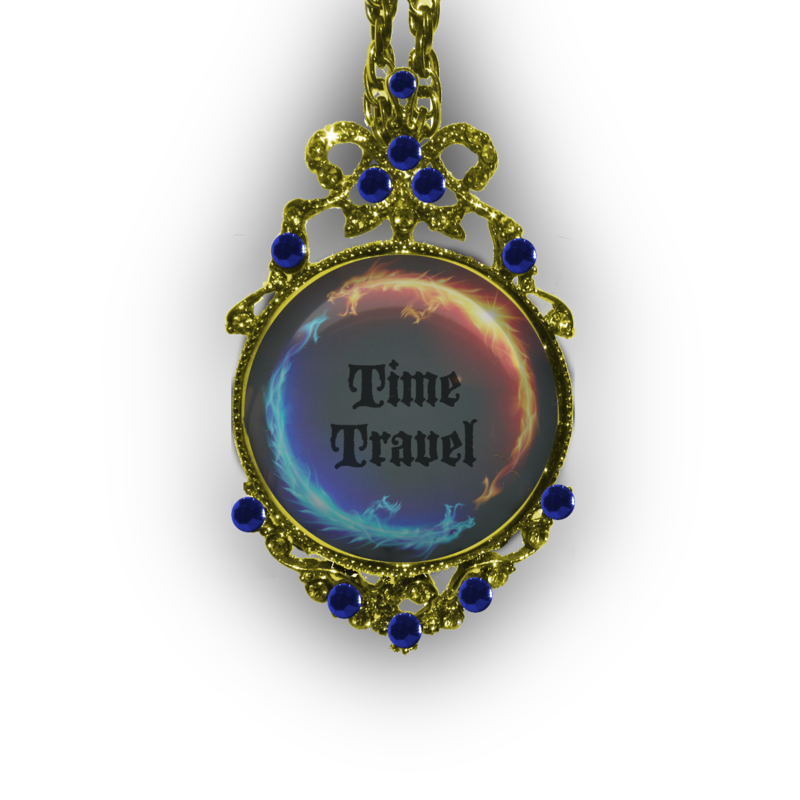 The element (inscribed in the dragon’s own bejeweled pendant) changes every week and must be a thematic component in your story. Note that you do not need to include the exact word in your story unless instructed to do so (e.g. “include the word ‘Rindfleischetikettierungsüberwachungsaufgabenübertragungsgesetz‘”). What Else: Results post Sunday evenings. Flash Points, a feature in which a particularly outstanding FF story is highlighted, posts on occasional Mondays. Noteworthy #SixtySeconds interviews with the previous week’s winner will post Wednesdays. I (Rebekah) post my own stuff sometimes on Tuesdays or Thursdays “just for fun.” On the menu this week? Why, it’s snow cream, of course! With a teeny bit of maple for extra flavor. Scoop yourself up a bowl of snow and come on in! * Word limit: 150 word story (10- word leeway) based on the photo prompt. Wawona Tree Road. Photo by the National Parks Service. Voice log activated. Time and distance travelled: eleven years, 62,000 miles. Strange. The jumps are getting smaller. Of late, my travel has become almost linear. Fewer extreme shifts; the realities I emerge in seem more and more alike. Personal note: my vessel appears to match the era. I can visually trace this society’s advancement. Very queer. Perhaps too soon to say, but I sense a pattern emerging. The parameters of my travel don’t seem as random. I’m passing beneath a tree now — or should that be through it? The trunk is hollow and serves as a tunnel. Oh, the universe and her comedy. Driven forty-five miles now: can conclude that this period is one of peace. One would be lucky to settle here, to carve out a life and grow old with dignity. Alas, the key to preventing the universe’s destruction is not here, and so, with haste, we must move on. I seek solace within ancient tales, of sap and water, root and growth. Blame the foolish ones. I left the time they began journeying through me. Cavalcades of foot and horse, cart and limp, that eventually became just drips and drops of soon to be dead things. A shuffling column of despair, toiling through the hole they cut within me in the time we towered like sentinels. A scar, marking their civilised progress. Their achievement as a culture. Of stone and blade, of fire and linearity. Foolish things, of minute lives and smaller understanding. Now I choose to exist within rhizome memories. I become the first root that tasted water; the trunk that rose toward space, the branch that colonised space. Better that that the reality of now, of withering roots and dead rain. Of endless winters and ash filled skies. The final achievement of the foolish. I loved the richness of the language. ‘Haven’t got a second,’ I said, assessing our new surroundings. Vehicle, of sorts; windows grubby, warped. Unfiltered sunshine. Early twentieth? Maybe? How could we be so far off, again? As Palmer scanned her screen, I glanced behind. Wow. A tunnel carved through a giant tree spanned the road – it must have been our vector. Huh. Organic, again… The jalopy groaned and shuddered, knocking me out of my thoughts. I turned back around, trying to focus. ‘What’s wrong?’ I side-mouthed, trying to stay calm. (‘Wow’, ‘Huh. Organic, again…’ the ‘course’ in Palmer’s ‘Of course.’ and ‘What?” (second-last line) should be italicised. If a kindly dragon could fix this for me, I’d be most grateful. PLEASE NOTE THIS IS A JUDGE ENTRY POSTED FOR ENJOYMENT ONLY AND NOT ENTERED AS PART OF THE CONTEST THIS WEEK. “Granddad’s not dead!” Tom shouted in the Crematorium. Shortly after this, his family moved to another continent. The day his Granddad decided he wanted to see his wife again; the day he entered the tree, Tom was there, watching as the old man carefully climbed inside and disappeared. Now, as an adult, Tom had returned. The tree still conjured limitless wonder and awe, 200 feet, a tunnel carved through the centre; it was breathtaking. His Granddad claimed it was a passageway to the past and had once gifted him a car; a 1925 Studebaker President. Over the years he had shared other objects thrown from the tree with Tom, like strange coins, faded postcards and old newspapers. Tom entered the tree and began climbing; suddenly large hands pulled him gently to the Ground. The voice was his Granddad’s and the slingshot Tom felt wedged in his back pocket told him all he needed to know. I adore the last line of this, really good characterisation. LOL! That “foreign girl” ticks me off sometimes, too. 😉 Great job. I love the idea of an unusual tree which is actually an alien carved into and stranded by human progress, brilliant! I was born in darkness. I pushed upwards, breaking through, reaching for the light. The sunlight was warm and nourishing. I continued my journey, surging towards the clouds. Those around me joined the race, trying to plunge me back into darkness, but I inched ahead, casting a shadow that stopped them in their tracks. The first winter came. I depleted my reserves, nearly starved, but then spring arrived with its replenishing showers. I endured many storms, the wind tugging at my very roots, but they held strong. Fire from the sky carved my neighbors in twain. Ice encased my limbs, and entire branches fell, but time healed all. I lost track of the winters. I was everlasting. Until the creatures arrived. They marveled at my size, at my beauty. Then they returned with the angry spinning teeth. They ripped out my heart, severed my limbs, carved through history. All to save a few seconds of travel time. Thanks – had a lot of fun with this weeks prompt! Beautiful language. I love the phrase “carved through history”. For 2000 summers the giant Sequoia stood resolute in the forest. It had seen many things, its age bringing wisdom. Animals – even minor gods – began to seek Sequoia’s regular counsel. The owl god accepted this, secure that the ultimate wisdom was his. One day though the only wisdom being sought in the forest was from Sequoia, so owl beseeched the tree to bow to him. Age though had bred great arrogance. Angrily owl vowed to kill Sequoia that very day. The giant swayed laughing, confident in its eternity – owl could not fight its might! While Sequoia slept the owl conspired with the Thunder-Bird sending back messages in time with the wind. In summers past, lightning struck Sequoia bringing fire; spring and autumn rains washed away the soils; and, each winter, snows weighed heavily. Unbidden, men drove a tunnel through its damaged base – just because they could. Owl – once more the wisest in the forest – hooted when snow felled Sequoia. It reads just like a native american folk tale. Your research shows and you wove it together very creatively. Good job. I had the same thought, that it felt like a Native American children’s story. Nicely done. The old man clutched the steering wheel tightly while he maneuvered through the tunnel carved into the tree, a chuckle escaping him as they cleared the other side. “Remember, Mabel, when we was young and we thought that tree was magical – that it could whisk us to some other time or place, some place better? I always wanted to go to the City, be in thick of things.” He chewed his cheek for a moment. Mabel stared out the window. The truck bounced as it hit a root. She’d learned long ago there was no such thing as magic, no such thing as escape. Her pa had taught her that, with his switches and his groping. Her husband had taught her that, too. She looked down. Her fingers were dissolving, her legs no longer visible. She smiled. At last. Yeah. Mine clocked in at 180 and I had to do a lot of snipping. Your story ha ha! I’m finding 150 really hard too. When finished mine was 200 originally. Of course! happy to. -for myself, when posting on various sites which may or may not be html-friendly, I put asterisks. Maybe that’s a possibility? Sorry b for bold and i for italic (inside ‘greater’ and ‘less than’ symbols ), but use that 3schools basic page to practice. Thanks! Or maybe I should say, thanks! Or thanks? There is a tragic beauty to this that I adore. First, yes. I killed two sentient beings and for that I deserve prison. You call it vandalism because you don’t understand. I was born three hundred years in the future. It’s a grim world but we’d survived … all ten billion of us. We still had hope. At least, until the aliens came in response to the distress call. You see, two of their children were maimed … by humans. We’d cut holes in their hearts. It took four centuries for their parents to get here, but they don’t see time as we do. I was supposed to go back to 1881 and prevent it, but we undershot. We had only one attempt and we missed. So, I did the only thing I could. I killed them. Maybe I did it fast enough. Maybe their cries won’t reach their people. I don’t know. I just know that I had to end their pain. I had to stop the trees from screaming. In retrospect, he admitted the lure of a Temporal Displacement holiday had been irresistible. To see actual trees and grass, to breathe air that didn’t need to be recirculated through a filter apparatus was something entirely foreign and forgotten to the people of his time. As the unfortunate result of rampant industrialization and the unrestrained exploitation of natural resources, this Yosemite place was a barren, irradiated wasteland in his age. He’d driven the vintage vehicle, actually powered by internal combustion, through the displacement portal and arrived in the sylvan wonderland without incident. The devil, however, lay in the return. That was certainly not happening as promised. For the past two days he had returned to the extraction point and waited for the telltale shimmer of the vortex opening. It had not. Hungry, thirsty and peppered by the bites of innumerable strange insects, he felt the first nagging suspicion that perhaps this had not been such a fine idea after all. The tree was ancient, and huge. Me? Just ancient. Time travel keeps one fit. Anyway, the tree. It must have been 400 years old. Older than the nation that protected the old-growth forest with a national park. It was as big around as a good-sized house. I respected it as a fellow survivor. It had endured storm and disease and war and centuries. Much as I had. I hoped it would survive me. Time travel isn’t an exact science, sadly. And when the temporal bubble appeared in the center of the base of the tree, that portion simply disappeared. Well, not simply. But the explanation of the physics behind it are rather tedious. I won’t bore you. Though, I guess I did bore the tree. Ha. Sorry. Anyway. I think the tree is strong enough to survive even such a grievous wound. Who knows? Maybe the park will find a way to put the hole to good use. “Yes!! Yes!! !” Jim cried hysterically. “What happened Jim, why are you jumping like a Ninja having a rash ?” The captain asked anxiously. “The world! The world is changed Sir. All the mobile phones, GPS, Laptops all those cool gadgets are gone. I have seen people helping each other and a resident just reported that there are zero deaths by war and fight.People live like a community and are actually happy,they know how to laugh” Jim’s voice quivered with amazement. “But…..how is that possible? Where did all those technological advancements go ?” Captain was worried more about technology than peace. “It’s 2090, I don’t make mistakes Sir” Wrinkles appeared on his forehead. “What about this huge tree? It looks like home of some huge creature…..” Before he could complete, a dinosaur clenched him in his teeth. “Welcome to 2090” Jim murmured paralyzed with fear. “Shh, you can rest at dark. Now stop whining. After the fantastic end line I did another read of it, which made me realise just how damn clever you’ve been, brilliant. Hee hee, this cracked me up! Love the line about the itchy nests! Talk of the tree circulated; a big hole they said, right through it, appeared overnight, strange sounds came from it. And people were going to investigate, as they’re prone to do, but they weren’t coming back – until one day one of them did. He seemed right enough, something different about his eyes, about the way he carried himself, and then he did something no one in the town had done before – he bought a car. They were new things, none of us liked them; noisesome, smelly things, they wouldn’t catch on we said, but he laughed when he heard that. And then one day he drove it into that hole and never came out the other side. It was the devil’s work they said, and he had the devil in him. But I still wonder some days, where he went, and if truth be told, go down there some nights and listen; sounds mighty fine to me. She giggled at that, giving me a gentle shove as if I had made it up to fool her. We stopped the car so we could walk around the vast circumference. “I can’t believe the road goes right through the middle!” She visibly shuddered, as she peered through the tunnel. I broke off a piece of ancient outer bark that would keep me anchored to our own time and slipped it in my pocket. I’d be safe from the time vortex that spiralled round the inner rings of the tree but my companion? Well she did ask for an adventure and I’d told her no lies! “We’ve got to do something to stop this sacrilege!” Joe shouted passionately. “But what can we do about it now, it happened so long ago?” Mary asked anxiosly. “what invention Hubert?” Mary asked. “Ive created a Time Travel Machine!It hasn’t been field tested yet, but if someone volunteered I’d send them through.” He intonrd pompously. “I’ll ned to calibrate it.” Joe stepped onto the circular platform. The cage was lowered over him. The Machine was engaged. Power hummed, mesh glowed hotly, and lightning flashed. “He’s away!” Hubert announced. Whwn the loggers came to cut the tunnel through the giant sequoia that formed the Wawona Tree Road they were surprised to discover an ancient human skeleton embeded deep in the heart of the tree. They scratched their heads and shrugged. Your Dragonyness,can you please change “HUbeet” to “Hubert”? Good day to be driving around the countryside, eh, James? Just look at this prosperous forest. Branches on the dirt road, grass all burned, the red river full of dead fish. Wait, I actually think I see some human limbs. Delightful. Now we’re headed into what seems like an elephant-sized tree trunk whose head was chopped off, and its knickers area shrilled to pieces. Like some sort of a magic gate, eh, James? This is unreal to you too? I knew it. Argh. Pesky hole in the ground. Almost stuck the wheel in. Good thing it’s wooden and gets out faster. What’s this? People in armor covered in silver tunics? Swords? And they’re saying something I don’t understand. Do you, James? No. Of course you don’t. Whoa. The chap in front has a vertical bow of sorts. And he’s aiming… Straight at my neck. Looks like it’s over James, old doll. At a first glance, to see Wawona tree after all those years was seeing how world has changed. I was five when my father took me to Wawona. There was a huge tree with a road down under. I remember my father standing by my side, drinking from his pocket bottle he carried through the Prohibition years, his grave voice asking “Isn’t it incredible, son?”. I already knew I’d never see my mother again. And a tear fell on my cheek. Today, my grandson by my side, I saw the tree fallen by the side of the road. But then, I saw the same hotel, the same streets, the same forest. I had no longer my father, long dead. I hate no longer him. I forgave my mother absence. But, even without the tree, the world remains the same. To see Wawona after all those years was like travelling through time. And realizing the only thing that changed was me. I liked the tone of this. Very nice. Eve crouched on bare, calloused feet. She was strong and had toiled. Sinewy limbs revealed her to be both prey and predator in this wooded terrain. Ava smoothed out the picnic blanket while her husband parked the motor. She crouched down to her gurgling baby: ‘Mummy’s going to get the picnic basket, from the car. I won’t be long,’ she sang. Movement. Eve broke into a noiseless sprint. This time, she would not stop. Solid danger lay ahead, and she fought the urge to skid or veer. The Tree had devoured her offspring; it would have to devour her as well. A flicker. Ava’s gut instinct brought her eyes to the tree. In no time, she was careering towards it resisting any urge to brake. eVVe ‘s journey brought her full circle. She burst from the damaged spacecraft, hurtled herself at what seemed like a rigid mass of tree and was gone. Please ignore comma in the part that should read ‘basket from the car’. Thanks. I couldn’t help it. When I floored the accelerator at the last second before entering the wormhole, I closed my eyes, kept them closed during a stomach-churning “drive” which seemed to go on for hours, then barely cracked my lids open when we lurched to a halt. I looked down at my clothes, and, by George, the scientists did it. The little algorithm they’d plugged in had transformed our contemporary clothing and vehicle to period pieces. “Did we make it?” Cyril asked, eyes still squeezed shut. Well, I shan’t reproduce my rude utterance here, but the bloody wormhole they’d assured us would stay open had closed. Two teens ambled to the young man still inside. The car rolled to a stop just a few feet in front of my trunk. I felt excitement pulsing from the two approaching, and fear throbbing from the third. Adrenaline was the only thing that kept him alive this long. Clouds rolled in to cover the sun as they reached Markie, saw his whitened hair, wrinkled face, and hunched shoulders. Thunder rolled in the distance. His fists clenched the steering wheel, eyes stared at the road ahead. Markie and the car he’d brought seventy years into the future disintegrated into ashes. Maybe now the humans would learn they simply weren’t made for time travel. I am going back, but you are not. I am traveling back to the time when I was whole, when I had no gaping wound and I stood here solid and strong and complete. All it takes is a push of a button. The Tree King gave it to me, you see, the button. The one that takes me back. I want to use it at exactly the right time. And that time is coming. Just drive in a little closer now, won’t you? Come on inside. Take a pause to admire my innards and laugh and joke. Let your car spit exhaust all over me. That’s right, enjoy yourselves. You’ve never seen anything like this, a tree you can drive right on through. And this is the last time you will. Yes, that push of the button came at just the right time, didn’t it. What’s that? I can’t hear you through my trunk. Love the malicious tone of the protagonist and the ending. “This’ll be fun, won’t it?” I said cheerfully, looking at Mary and Anna and smiling brightly. They glared back. They did not smile brightly. “Right over there, ma’am,” the ticket attendant said, pointing. We made our way over, the girls glumly watching their forced-to-be-present, trudging feet with stoic martyrdom. “What’s that?” Anna suddenly exclaimed, sounding disgusted, and maybe even a little bit curious. “Uh-huh,” muttered Anna, already bored again. “They’re called Trees, mum,” yawned Anna, while Mary chewed disinterestedly on her oxygen gum. I wondered if teenagers had always been the same. Whoops! Tried to use @zevonesque’s tips and put the title in bold, and instead I put the whole lot in bold! Rebekah, perhaps the bold would rub off with the swish of a dragon’s tail?? My teenage daughter has explained to me where I went wrong. Touch of irony there! Sorry I was trying to be of assistance. Causing problems everywhere. Tim stared at the portal and thought hard. Each journey was a commitment. One year, no going back, no swapping personas. So far they’d been lucky. Jessie called it karma; he called it luck. Tim stared at the gnarled trunk and peered into its yawning mouth. Others would pass right through, but not them. If they kept going they’d come out with different lives. Digging their heels into the flank of their horses, they cantered in. “You sure this is a good idea?” Ginger asked, frowning at the road ahead of them. The trees either side of it were awful tall and something about their stillness scared him. Ginger didn’t reply. He was new to bootlegging and the idea of getting caught still worried him. Peering ahead, Ginger saw the tree in question. It was massive, gnarled and ancient. “Don’t go through,” he said, abruptly afraid. Shiny laughed and drove faster. Ginger closed his eyes and waited. Where would they be when he opened them again? More to the point, when would they be? Good characterization. I enjoyed this. “Where’s the DeLorean?” asked Marty. Marty stared wide-eyed at him, a reversal of their usual roles, then got in. They got the speed up to the required 88 miles an hour by driving down a very steep hill, then vanished. They left the present behind, and the past took hold of their future. Time travel causes sentences like that one. They thought that their arrival had blown a hole in a tree, like a cartoon character going through a wall. They didn’t notice that they had just driven under a giant foot. Sometime in the future they would come back and warn themselves of this, but they didn’t notice the sign that they would leave because they didn’t know that they would need it yet. Time travel causes sentences like that one too. The sign read “Here Be Dragons”. I. Love. This! Wonderful to be reminded of Back to the Future, and a clever story. Love the joke about time travel messing up sentences! Time travels strangely beneath his branches; sentient-sleepy. The first time he recalls, the boy plays with his car; an old model. Feigns interest in toy over girl, despite her best efforts. Later, he pushes her into the dirt when she tries to play. She cries. He ignores. Time travels onward. Older now, the transport is real. He learns their names. Nick and Sara. Nick driving, seeking to impress, as they pass underneath; oblivious. They are wrapped in each another. He envies them their youth, the promise; that still to come. Time travels onward. Time marks their faces, their fondness unchanged. They picnic in his shadows, ring on her finger, hand at her stomach; an unthinking caress. Time travels onward. Sara on foot. She travels alone. Shelters in the shadows beneath him. Lies there; oblivious to the onset of traffic. Closes her eyes. Time travels onward. She stirs. Leaves the toy car in her wake; an offering to time’s past. I really like what you’ve done here. Such great rhythm and to come full circle at the end. Thanks! Pleased it comes across the way I was aiming for. Definitely a challenge keeping things short! When I drove into the tree tunnel I was thirty four years old, relishing the way my prized Audi R8 gripped the road beneath me, pretty pleased with myself and life in general. I had an Ivy League education, my business was known as the ‘new big thing’ and everything looked good. My gorgeous wife Carol was waiting at home in our brand new house, complete with hot tub and pool table. When I reached the other side of the massive old trunk, I looked in the mirror and saw my grandfather staring back at me. But not the Grandad I knew, no. I see him as he was in his twenties, dark-haired, grinning, young and vital. The car beneath me is no longer my awe inspiring Audi but the old jalopy I saw in countless pictures from my Grandad’s youth. How in the hell has this happened and more to the point…why? Wha? A gentleman in a seersucker suit and white Fedora appeared to be talking to him. Stu nodded weakly as the man extended his hand. I really like this, there is such a natural flow to your writing which makes it very enjoyable to read. What is the proper way to do a word count on a date time stamp? I’m fine with however your program calculates it. Word, for me, counts by spaces and shows your example at 5 words. I cut through my selected period at an acute angle, taking up the target’s mind and assuming their body for nanoseconds of objective time which pass subjectively at glacial speeds. Assuming my temporary form in darkness, I fly blind for a hundred years, the sound of my progression a droning rumble, elongated into infinity. Finally, a speck of light in the distance, the proverbial tunnel’s end. Now I will see the ancient world in all its splendour, the life and light I had hoped for when I hooked my consciousness to the time sphere. Oh no! LOL. This made me giggle. Hee hee hee, love it! The tree had stood there for as long as anyone could remember. Its branches stretched towards the sky as it embraced the clouds and no one could walk beneath the shade cast by its shadow without feeling the weight of its age pressing on their very souls. Its beauty was breath-taking, stunning in its simplicity because it had never claimed to be anything but a tree and yet it hadn’t been enough. The men that cut away at its bark hadn’t been able to hear its screams, none of them could feel the pain it bled in the sap that leaked into the earth beneath its roots. But something did hear and they came, ripping their way through time and space as they answered its silent cries. Small fingers brushed its bark, catching its falling leaves and as the tree wept it wasn’t alone in its despair. Saving it was impossible; beyond even their capability but revenge…they could manage revenge. No one uses time travel for photography. Sure, there are the obligatory tourist pictures, but no one uses time travel as an element of the photography itself. I mean to add a new dimension to time lapsed photography. For four centuries my camera will flash (flashed? has flashed?) into existence at the same time each day, take one picture, and move on to the next year. 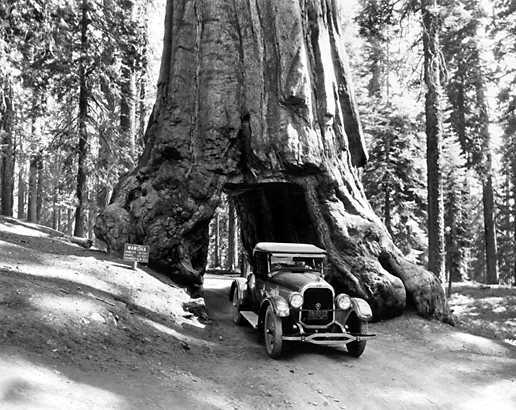 The first picture occurs May 11, 1967 5:00 PM, at the Wawona tree tunnel. I know a little of the area’s history. The lush forest gradually dies and burns. People settle the area, build a city, and abandon the city. Splicing the pictures together should make an interesting film. I tap in the last of my calculations and close the case. Should I have my camera return before I finish programming it? I don’t have the camera back already, so I must not have. I press the power button and start my camera’s journey. Traveling back in time, I remember when my friend, Susan, got a well-used Model A Ford for her sixteenth birthday. Her father painted it blue and gold, our high school colors, and we became road gypsies. The whole gang came along: three in front, three in the rumble seat. The smallest girls balanced on the laps of the biggest boys who relished the opportunity to hold cheerleaders and baton twirlers tight against the perils of the road. Shorter excursions saw extra boys on running boards and girls sitting on the backs of front and rear seats. One day, we packed on twelve bodies and celebrated by driving through the Wawona Tree. Susan was grounded for a week after her father heard about the escapade. That meant half the senior class was grounded as well. At week’s end, Mr. Thompson traded in the Model A for a two-door Corvair coupe and set strict passenger limits. The party was over. Panicked legs traversed rock and brush. Howi was an obstinate child. He was not to venture out alone. His father was a great warrior of the Mi-Wuk. Howi would also be a great warrior. For this he must make a bow. It was for a bow he came alone to the great trees. The panther almost had him. Howi made for the sacred fire scar tree. He prayed to Spirit Owl for deliverance. He prayed Spirit Owl turn him into a rabbit. A rabbit can dodge and fit in the small hole at the tree base. He was almost to the tree. The panther leapt at its prey. The shadow of an owl crossed over Howi. He entered the hole. It was so big. The panther was gone but a monster still chased. Howi heard it scream ahooga! Thump, thump. “Charles dear I think you’ve run over a rabbit” said the passenger. Oscar loved his iPhone 40TT/S with built-in Time Travel App. It made driving through time flawless, without the unpleasant face-flattening side effects of the last model. “Storm the beach at Normandy and be home for dinner!” the advertisements proclaimed. Oscar longed for the Siri of his childhood, who was clueless but didn’t talk back. Oscar drove through the portal into the abyss. When he emerged, he smiled. There it was, Bob’s Big Boy, home of the original double decker. “Yum!” Oscar proclaimed, rubbing his hands together and jumping out of the car. Hee hee, this made me smile. Her mind came back to reality. Her daughter had died of Cancer and this young man was Billy, whose father was now in that same place with her daughter, all because she…no, it was not her fault. Those things did it. When the road was first built through the Wawona Grove in what would later become Yosemite National Park, the traffic was very sparse. It would take a few years for the right person to pass into the tunnel. The first few victims were traveling alone and were not immediately missed. As time passed the road became more popular. In the thirties a couple people a year were disappearing. Authorities offered no explanation. Through the forties, fifties and sixties the occurrences increased until finally the park service changed the route of the main road. They denied the rumors, but wanted to avoid negative publicity. In 1969 the tree died and quickly collapsed. The rangers found some sophisticated equipment installed inside the tree. They quietly scrapped it. Park Headquarters has a file labeled Wawona Tree Collections containing about a hundred very large checks from the Organ Donor Network. They are all postdated to 2045. I adore how quirky this is–an absolute delight to read! Thanks. I appreciate your taking the time to read it. Really original idea, love it. We’d spent an idyllic few days in the Croatan National Forest where we had a summer house. Until mom discovered my stash of beer. How else is a fifteen year old supposed to stomach a family holiday? ‘In for a penny, in for a…’ I thought, determined to escape mother’s wrath. There it was – hidden in the bark of an enormous tree – father’s pride and joy. Mother’s shouts floated on the still air as I climbed into the gleaming chassis. I pulled the lever, watching clouds spin past as the time-machine sped through the vortex to another time and place. I turned with a start. George, my six year old brother grinned at me mischievously from the back seat. Over the years we took in many sights, but we never made it back to mother. I long to go back. Back to when I was young, to when my roots felt strong, to when I wanted nothing more than to branch out into the world, soaking up sunshine. Life was easy then, back when I was solid, before she ripped this gaping hole in me. Many have passed through since. None have fixed me, though a few tried. I eye the giant hulk of a tree before driving underneath it. In and out in a flash. That tree and I are alike. Relics of a past life – a passed life -, shells of who we once were, damaged by those who thought they’d found a better way. I stop the car. I walk back to the tree, touching it, caressing it. “I’m sorry,” I murmur, not sure whether I’m apologizing to it or myself. Spindly forest surrounds us. We are giants among weaklings, the tree and I. Scarred. Broken. But we are still standing. Well done. Tying the man to the tree so cleanly was excellent. He walked toward the enormous tree he’d just passed through, kicking up little dust feathers as he went. The price of dark matter was precisely the reason he’d embarked on this little journey. Retro-resourcing was a highly profitable, highly illegal practice, and Kevin was the best scout in the business. He took several minutes to walk the circumference of the tree, inspecting it. With processing techniques that wouldn’t be invented for another two hundred years, a tree this size could provide energy to a million homes, maybe more, for a tidy six-figure profit. Kevin nodded. It would do. It would do quite nicely. Love that I instantly believed the world-building. Very creative! The giant’s hand came down rapidly. Heart in his throat, Jeffrey quickly smashed buttons on the dash. The hand slowed, then froze in place: its first two knuckles resting on one side and thumb on the other, nearly brushing the windows. He urged the vehicle through the newly created arch, beneath the lined palm patterned like old bark, and shivered. “Too close.” he whispered. “Cool.” Giggling, he smashed a button and the frozen giant rejoined the current time, smashing flat against the ground where the car had just been, sending plumes of dust up into the air. A bellow of anger chased after them and Jeffrey merely patted the dash, secure that they could escape any pursuit. After all, they had the time. “One carry-on.” A card fluttered to the desk. “Pre-Approved,” Phillipa said, voice hard. Phillipa nodded and stepped to the transport pad. The world twisted and broke, depositing her in a wooded area. She checked her bracer: May 28th, 1928. Sighing, she looked for an area to set up camp, her high-powered rifle heavy in the bag. She had a month to wait for her ex’s great-great grandparents to come through. Ugh! That’s supposed to be “go there” not “got there”. Me and my dumb double-tapping fingers. Sorry. And like magic, your original intent is restored! Oh my. Now that’s an ex bent on revenge! Clever. The time-traveler ran for his life, slipping through crowds from 1980s Bombay to pre-Alexandria Rhakotis. He flung his sweat-drenched, petrified body through doorways hidden in the dust particles of afternoons scattered across 3 millennium. He crossed the Rubicon before there was even a Rubicon. The car remained on his heels as it intentionally and heedlessly ran over countless bystanders just to get to him. It was a car like a hearse, stinking of flesh and certain doom; the stench found him, curled around his ankles and up his torso, hovering at tips of the hair on his neck. He prayed as he jumped into a very distant time–perhaps it was the early Cretaceous. He stumbled over a root in a dense forest, recovering and looking back to see the vehicle zoom through a massive cavity at the trunk of an even larger tree. The car went through him before he could blink. His dying gaze lingered on the rich brush. Really great pace to this and great imagining. “If not, it’s some nostalgic rich boy who went for a drive and used a filter. Or vintage camera,” she acceded. Materializing from nothingness, a man pushed through the door of Malcolm’s Lost Loves Locating. “Whom do you seek?” asked Malcolm after beckoning him to sit. He slid forward a photograph of a woman in a cloche hat posed before the skyline of the ancient city of Los Angeles. Oh I really like this so much world building, makes me want to read more of it! David had work to do. He couldn’t be just be lying on the ground, staring up at this tree. But he couldn’t help it. In reality, he just wanted to enjoy the tree a few more seconds. This must be decades old, this tree. It’s vast, and in a way, comforting. A living soul, giving the earth oxygen, giving him shade. And what did he do in return? He blasted a goddamn hole in it. He peaked his head up, seeing his confounded time machine. Upon further reflection, it was more like a square. He should be happy. He’s just accomplished the impossible. But he felt too bad for the tree. And also for the bank that he drove into before the time jump. His calculations of hitting giant walls to initiate the jump have now proven to be…consequential. It’s decided. No more bank walls. David gives the tree one more glance. Bye, tree. I’ve got work to do. We’d discovered time travel centuries before, but we could only travel within the parameters of our own history. Thus we saw our ancestors, former leaders—all events we had studied in our youth. We’d never gotten to see other dimensions, other galaxies, other worlds. This job would lead us to an entirely different planet: Earth. It was the perfect site for our new colony. We began introducing our technology slowly to the earthen race, choosing first to familiarize them with fire, later aqueducts, and still later what you see here: mass roadways, moving vehicles. The process was slow, sometimes frustrating, and at times we had to “clean up” our mistakes, creating civil disputes between the existing races or, though we aren’t proud to admit, even starting wars to destroy, hoping by destroying some we could rectify the masses. Perhaps in the next millennium the job will be complete: for now, our focus is acquiring humanity. Eloise huddles alone in the back seat of the big Mercedes. “It’s nice out here isn’t it, Mother?” Gerald glances over his shoulder. Eloise closes her eyes and drifts. 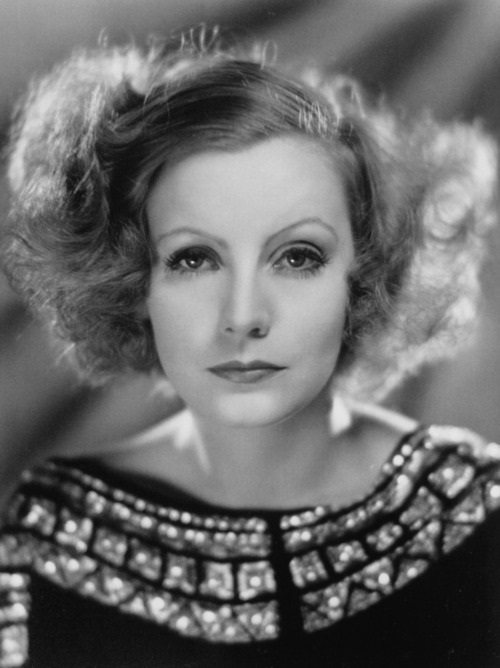 She should have married George. That was her mistake. He was gentle and kind, but she married Jack who never loved her as much as he loved her money. The children took after him. The air grows warm and ripples against her. Eloise hears a pop, and the car glides to a halt. She opens her eyes. Gone is the Mercedes. Eloise now sits in the driver’s seat of her father’s car. Her skin is smooth and youthful. She smiles. Of course. This is the road to George’s house. She’s been given a second chance.